Bed bugs are a common problem during the busy holiday travel season. There’s nothing like the feeling of traveling home for the holiday season. Whether you’re a college student on break or returning home as an adult, there’s something magical about heading home to visit family and friends this time of the year. But whether you’re traveling by car, bus, or plane, it’s important to know that you may be traveling with some unwanted hitchhikers. We’re talking about bed bugs intruding on your holiday travel plans. Check for signs of bed bugs – Check your surroundings for any signs of bed bugs while traveling. Remember they could have infested the taxi, bus or airplane. Commonly found on mattresses, you want to look for dried feces (looks like mold), dark blood stains, eggs and egg casings, brownish, almost translucent skins maturing nymphs have shed or any live bugs resembling an apple seed as adults. Check your bags for bed bugs – Once you arrive and before bringing suitcases in and settling into all the comforts of home, it’s important to check your bags for any of the above signs of bed bugs. Also, it’s a smart idea to wash all your clothing in hot water in case you suspect any bed bugs have found their way into your luggage. This protects you and the entire family. Continue to inspect for bed bugs – When you return from the holidays, you want to repeat this process again after traveling back to your college dorm, apartment or home. Also, continue to inspect your surroundings for any evidence of a bed bug infestation. If you happen to wake up with red bites, this could be another sign of an infestation. In which case, it’s time to call in the pest control professionals. 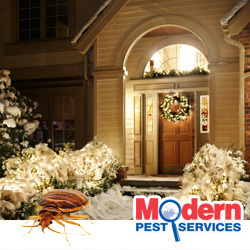 For families in New England who would like to learn more about bed bugs as well as how to get rid of bed bugs, please contact Modern Pest Services today at 1-888-997-3312. We provide canine inspections and heat treatment (both electric and propane) for homes and businesses in Maine, New Hampshire and Massachusetts dealing with bed bugs! So don’t let the threat of bed bugs ruin the joy of the holiday season. We’re here to help if you find yourself facing a post-holiday bed bug issue.